Typewriter Keys Paint Picture is something you should read. 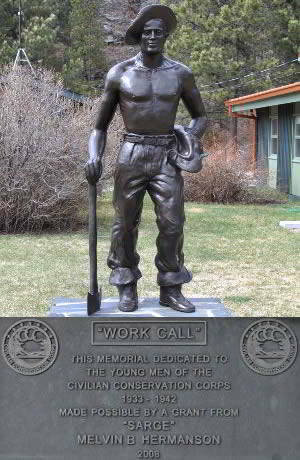 Shortly after President Franklin Delano Roosevelt created the Civilian Conservation Corps in 1933 several newspapers were lauched that related to the depression era program. The most notable would have to be the national weekly publication and semi "official" CCC publication, Happy Days. It was a privately owned paper that aimed at serving the CCC's new enrollees. Its owners were Melvin Ryder, the paper’s editor, Ray Hoyt, the managing editor, and Theodore Arter, Jr., the business manager. Ryder had been on the staff of The Stars and Stripes, the famous doughboy newspaper during World War I. The owners of Happy Days encouraged and instructed camp editors in the production of camp newspapers in the thousands of CCC camps. There would be more than 5,000 camp papers published by nearly 3,000 of the CCC companies from 1933 to 1942. Throughout much of 1939, when the contest craze was at its height, Happy Days launched a series of events paying five dollars for the best answers to various relevant and timely, sometimes trivial or humorous questions, such as: How has the U.S. Army helped to develop the country, aside from protecting it from invasion and fighting its battles? Who is the most dangerous enrollee in camp? Why? Other questions included "What Would You Do With $10,000?" The majority of the contestants indicated that they would buy a farm, though many would tithe, give to the poor, go to college, or marry. In response to the question "What will you be doing in ten years from now?" the winners had hopes of being salesmen or owning their own farms. Happy Days also took note of a "typewriter picture" portrait of FDR, created by using the keys as the drawing instrument," published in the Lakeshore Camp News (Company 1751, Knife River, Minnesota). Happy Days saw no reason why this could not be turned into another contest with, appropriately, an Underwood portable typewriter as first prize. From 1874, the Underwood family made typewriter ribbon and carbon paper. The original Underwood typewriter was invented by German-American Franz Xavier Wagner, who showed it to entrepreneur John Thomas Underwood. Recognizing the importance of the machine, Underwood bought the company. The typewriters made between 1896 and 1900, had "Wagner Typewriter Co." printed on the back. The company was reorganized in 1927 when John Thomas Underwood was elected chairman and Wagner president. While attending my late brother's estate sale I noticed one of his old typewriters. It was an Underwood. Funny how things trigger memories. I knew my brother's typewriter may not be of the same vintage as the one's I envisioned from the CCC articles and stories, but still I had to have it if only because it had been his and it reminded me both of him and of the stories I had heard and read about over the years. A little research suggested that it was most likely manufactured late 30s, perhaps early 40s. 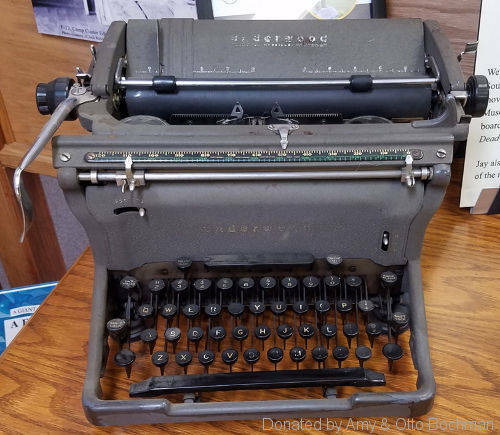 The typewriter has been donated and is now part of items displayed at the Civilian Conservation Corps (CCC) Museum of South Dakota. It's unlikely that it was used in a CCC education classroom but many like it were. Funny how things trigger memories.